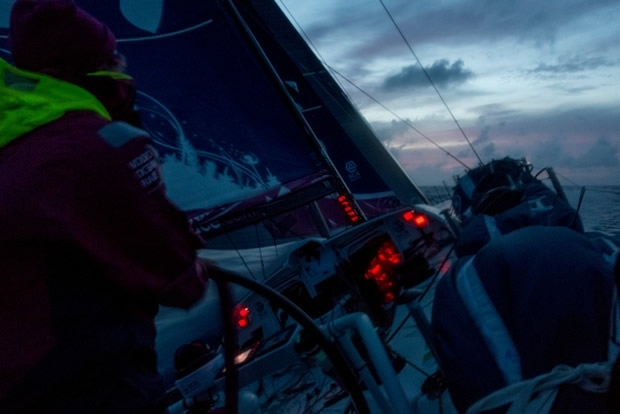 Having been on starboard tack, since they made their manoeuvres north on 24 April, to clear the easterly bulge in Brazil, finally eight days and a hemisphere later, on Saturday the Volvo Ocean Race boats gybe en masse on to port. Sailing up past the Caribbean, the boats were picking their lanes with Abu Dhabi Ocean Racing and Team Brunel holding the northeast, Team Alvimedica and MAPFRE, generally the furthest west with the Franco-Chinese 'terrier' that is Dongfeng Race Team usually somewhere between the two and with Team SCA bringing up the rear. Through this period the northeasterly duo and Dongfeng have been swapping the lead. Over the course of Saturday the wind started veering into the southwest and the boats took the opportunity to turn their bows north until the late afternoon when (while lying some 320 miles northeast of the BVI) the wind ended up at 150° causing Abu Dhabi Ocean Racing and Team Brunel to gybe off to the WNW. Just to their west Dongfeng Race Team gybed just ahead of them to take the lead while MAPFRE and Team Alvimedica made their manoeuvres around two hours after the front runners. While at the beginning of Saturday there had been almost 30 miles of separation between fifth placed MAPFRE and the nominal leader - Team Brunel - after the top five had gybed this deficit had plummeted to just over 11 miles. However port tack was not to last so long with the wind going through a hiatus on Sunday night and filling in from the NNE once again, forcing the boats to tack back on to starboard once again. With Dongfeng Race Team retained her lead, Team Brunel did well keeping up in her berth furthest north while Abu Dhabi Ocean Racing almost managed to remain in contact while MAPFRE and Team Alvimedica took longer to see the new breeze fill in. In the opposite of their fortunes on Saturday, so their 10 miles deficit on the leader reverted back to being closer to 30 miles by the close of play. Generally despite this major change of wind direction the boats were maintaining a course taking them towards Cape Hatteras, however this Turesday morning with the boats have turned on to more of a northerly heading. Again their approaches to doing this have differed with Dongfeng making a wider turn, leaving her furthest west, while Abu Dhabi Ocean Racing (as well as MAPFRE and Team Alvimedica) prefered to 'cut the corner'. The reason the crews have only chosen to turn their bows north today is that to their northeast lies a giant area of high pressure and the further east they sail the more they risk falling into light winds. So conditions are set to go soft today with the wind due to fill in from the southwest, indicating that they have crossed the high. Unfortunately this happy scenario is not set to last because there's another significant area of high pressure developing over Rhode Island and there looks set to be another giant hole in the wind for the boats to tackle (not to mention the ebb and flow of eddes in the Gulf Stream) before they can reach the finish line. Don't hold your breath. There’s a conflicting conscience onboard. With less than 600 miles to go it’s easy to get excited about the semi-imminent arrival in Newport, where the Volvo Ocean Race Village officially opens today. We have been looking forward to racing back into Newport ever since we left almost a year ago. However, those six hundred miles seem too few when you consider we float in fifth and 25 miles back from the leaders. That is by no means an insurmountable mark but if the wind continues to blow like it has it will be hard to find a way back to the front of the fleet. Fortunately, the weather models suggest a total shutdown of wind about 150 miles south of Newport, 2-3 knots. It’s certainly not ideal from a sailing standpoint but it may stall the leaders long enough for us to rejoin the fray at the front. It’s an opportunity we’re hopeful for but certainly not counting on, which is why it’s been so beneficial having MAPFRE glued to the horizon on the bow. They’re continuing to push us hard and after several days of trading places they’ve been smoother in the stronger winds since yesterday’s cold front—also confirming (and exploiting) our shortcomings going upwind on the jib. But we’ve just peeled to the Fractional Code Zero and as the breeze lightens and lifts approaching the next area of high pressure, we will hopefully find ourselves back in downwind conditions that play to our strengths. It has happened so many times this race, that after thousands and thousands of miles spent crossing this world’s oceans it is the final hundred or so that decide the outcome. As much as we’re already thinking about Newport and how great it will be to get back there, we promise we’re doing our best to prepare for every opportunity we may get between now and then to show how far we’ve come since we last left! Either Dongfeng sees something in the west that we don’t – or we accidentally faked them out around midnight. Naturally, we prefer to think the later. The moonlight is shining in beams through the hatchways echoing its spotlight that’s illuminating the racecourse in the early morning hours. The thin mast light of Brunel can be clearly seen 4 nm behind and to leeward. We don’t know where Dongfeng are. Throughout the day, we’ve all dared each other to sail lower and lower angles to try and gain bearing to leeward before our collective inevitable push towards Newport. It’s a trend we started earlier in the day when we tore around Brunel at sunrise into second place. Brunel responded by doing the same – putting up a larger sail, sailed a lower angle, and closed down to our line – scarily gaining 5 nm in the process. Here’s the catch – prior to the sked, we started to sail lower…again. Coincidentally, Dongfeng popped up on AIS at the same time. We could see each other for a brief moment. If Charles has even one-tenth the obsessive habit Ian has in the nav station then they would’ve seen us. Like flying Dutchmen in the night – insert Brunel joke here – we both disappeared again. At sked time Dongfeng was 14 nm away having matched our same lower course. With no one in front of us, we’ve pointed north and gunned it. The timing is perfect. There’s an eddy of current spinning off the Gulf Stream ahead and any further west than we are and you’d sail against it – automatically stealing 2-3 knots of speed away from your progress. We’re betting that Dongfeng will struggle to get around it. Ian has been in a constant state of tension all-day – cover Brunel and stay locked in to second place or attack Dongfeng if there’s an opportunity. We’re now 48 hours away from the finish line and that choice might have been made for him.